Please visit HighLowAha and cast your votes for your favorite recipe this week! Look over to the right and scroll down a bit; you have until this Sunday at 9pn EST. Thank you! When Kate and I were first given the guidelines for this competition, we were informed that we could submit something we've already made/blogged about. I mentally scoffed at the idea; I entered this contest to hone my culinary creativity, not to just repost stuff that's already here. When tortilla was chosen as this week's ingredient for HighLowAha's Superbowl Snack Throwdown, however, I couldn't get this dish out of my mind. I tried, I really did, to come up with something else, something that would be creative and all that. But I couldn't. I am so infatuated with these that they're all I can think of when I hear tortilla. Or Morningstar. Or taco seasoning. They've taken over my mind. I wish I could, at the very least, present you with some alternative or adaption, but quite frankly, I haven't deviated from Hungry Girl's original recipe at all. There's no need to. They are delicious, easy, cheap, fast, and healthy - absolutely perfect. 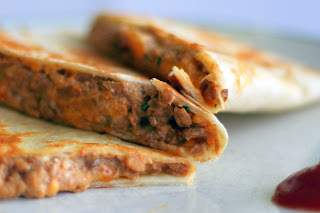 These delicious little quesadillas are sure to be a hit at your next get-together; my husband and I eat them for lunch at least once a week. 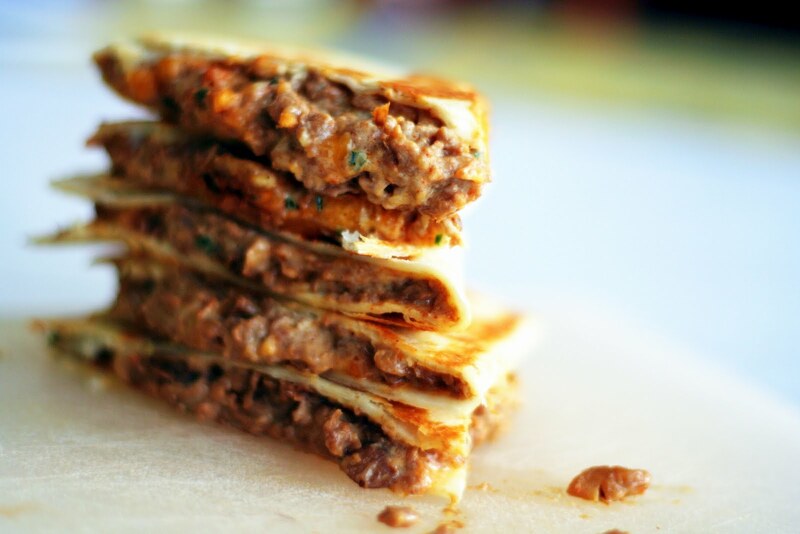 Make these now - don't even wait for Sunday's games. You will not be sorry. In a small microwave-safe bowl, combine soy crumbles, cheddar cheese, scallions, sour cream, and seasoning mix, stirring thoroughly. Microwave for 30 seconds, stir again, and set aside. Lay tortillas flat and spread 1/2 cheese wedge evenly over one half of each tortilla. Top the cheesy tortilla half with soy crumble mixture and fold over. Bring a medium-large pan sprayed with nonstick spray to medium heat, and lay quesadilla on it (or more, if they fit). Cook for about 1 minute, until slightly toasted on the bottom. Flip and continue to cook for about 1 minute, until both sides are toasted. Remove from heat and cut into four triangles. Serve with sour cream or ketchup for dipping, if you like. Enjoy! I love quesadillas. I have not had a really good one in a while so now my mouth is watering.